It’s a devastating critique. Syria is being kept in the dark ages because of a lack of American culture, and poor access to the internet argues a Gulf-based journalist. "Less fortunate young Syrians who [didn’t go to the American school] used to look forward to movie night at the [American] Cultural Centre every Wednesday. … Movie night was a refreshing two hours of enriched entertainment in a city where American culture is hard to come by." The problem is, the op-ed is littered with factual errors which drill a hole through Rasha Elass’s central argument. She rightly mourns the closure of the American Cultural Centre – shut in retaliation at the US army’s attack on a village near the Iraqi border last year. But to say that Syrians would flock there to get a rare glimpse at life in the land of milk and honey is just wrong. American culture is everywhere in Damascus. This is not North Korea. Walk down any Syrian street and it won’t be long before you come across a shop filled from floor to ceiling with American DVDs – films, documentaries and TV series, all subtitled, all costing pennies, and many available here before they come out in the States. Elass bemoans the lack of up-to-date Western newspapers. It takes three or four days, she claims, before they clear the state censors. True enough, but even in Beirut the papers are at least two days old. And it’s cheaper and easier to scan through the articles on the internet, surely. But Elass didn’t have much luck with the web. 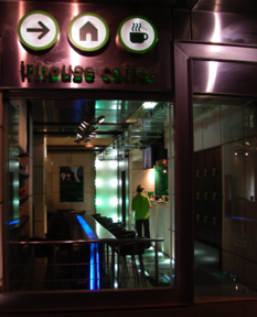 Sitting in her upmarket cafe called InHouse – whose green and grey colours, comfy sofas, and students spread across the tables make this place a identikit copy of Starbucks (there’s that American culture again) – she found that three of the five websites she logged on to were blocked. Even the staff in InHouse could’ve helped her download a little program which runs in the background on your computer, and lets you visit any site you like – blocked or not. Wifi is becoming so popular in Damascus that it’s hard to find a cafe without bright young things tapping away on Facebook (yes, that’s Facebook – the site that’s ‘banned’ in Syria). Although Elass tells us that InHouse is one of the few places you can log on. Syrians are a lot more connected than she’d have us think. According to the International Telecommunications Union, the internet penetration rate is actually 17% – not a measly 3%. And that’s not the only thing she underestimates. She quotes an average monthly wage of $40 – that’s the weekly wage, not the monthly. And that only applies to government employees – in the private sector it can be considerably higher. Syria is a country with an active blogging community, high mobile phone usage, and growing level of English-language skills. To claim Syria’s youth is covered in a cloak hiding the outside world from their innocent eyes is painfully short of the mark.